Early on Tuesday, September 18th, approximately 75 cops from four municipalities—Saanich, Central Saanich, Oak Bay, and Victoria—surrounded Saanich’s Namegans Nation tent city with police tape, declaring the site a police operation and preventing supporters from entering to assist campers. Police told camp residents to pack up their belongings and move to a municipal park to spend the night, threatening to arrest anyone who did not obey. One supporter was arrested for crossing over the police line, and by the end of the day, cops had erected a fence all along the provincial land where the tent city had stood for less than four days. 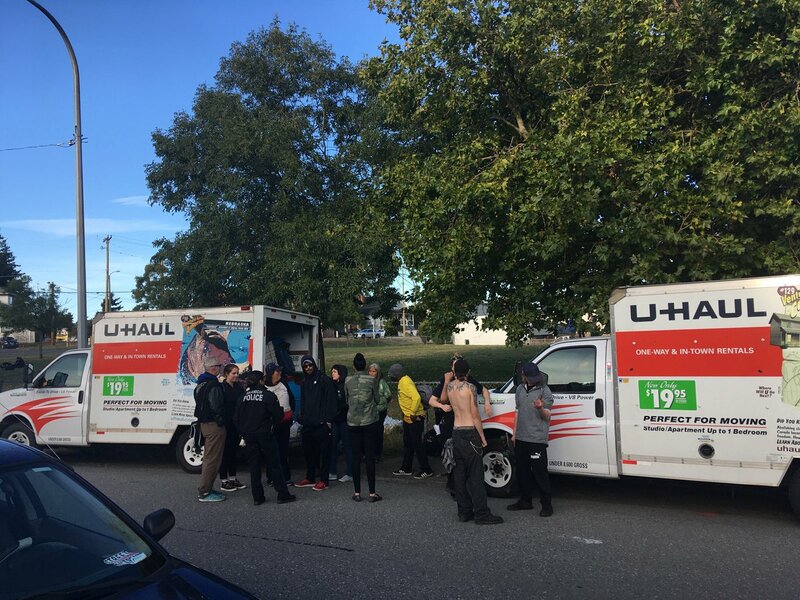 Supporters quickly organized two trucks to help campers move their possessions to a nearby park, where bylaw, park, and police officers were already waiting. They told residents that they would only be allowed to enter the park with a sleeping bag, a tent, and one change of clothes—all other possessions would be confiscated, ostensibly due to the District’s “chattel” bylaw, which states that unaccompanied possessions are prohibited in Saanich parks. But the displaced residents were there with their possessions, and informed officers that they would be remaining with them all day. By interpreting the Saanich “chattel” bylaws to include homeless peoples’ held-possessions, the District is casting homeless people as legally non-persons who have no claim to possessions, even when they are physically standing with their things. Parks, bylaw, and police refused to back down from their demand that people abandon the bulk of their belongings in order to camp overnight in the park. Finally, just after the 11:00 am deadline to close the campground, and under pressure from outside and—reportedly—within their own Party, the NDP government relented and backed down from its threat to shutter the Goldstream campground. The NDP’s constant harassment and displacement of the Namegans homeless seems to have reached a point of attrition. But why did the BC government spend such an expensive and futile effort to chase and scatter the Namegans homeless? 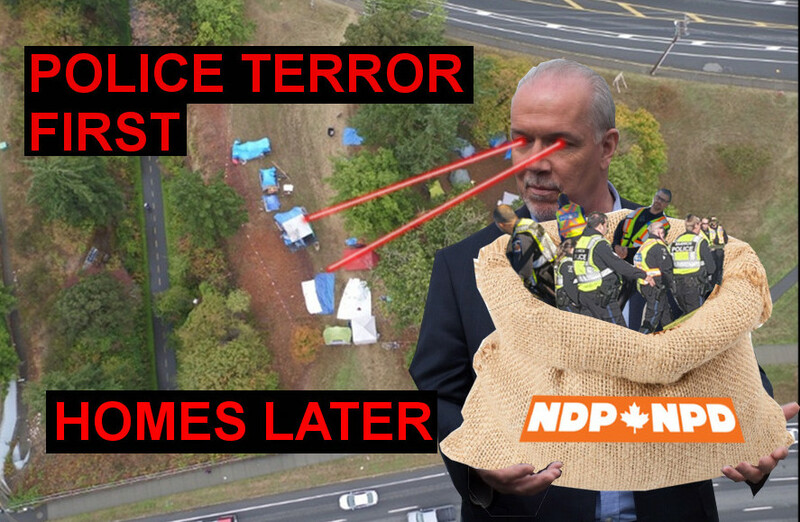 And what does this NDP-ordered campaign of police terror mean for those caught in the throes of the homelessness crisis in BC today and tomorrow? 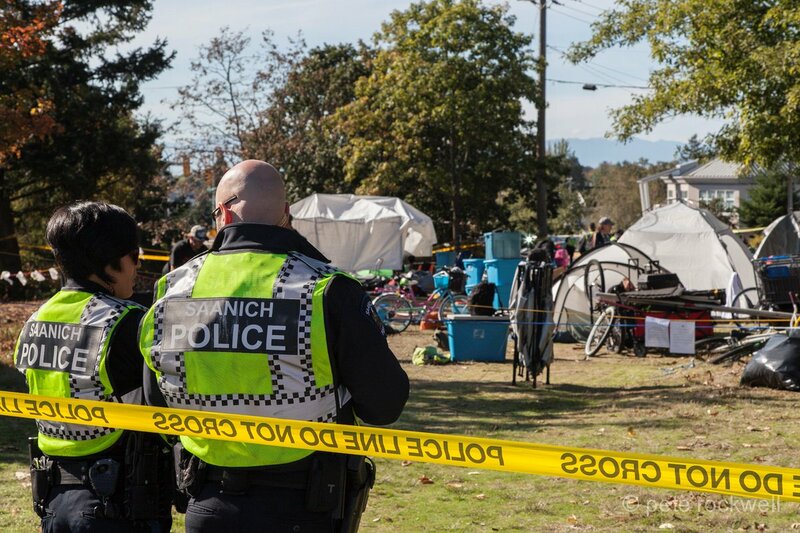 The event that set this sequence of evictions into motion was the Supreme Court decision to grant the City of Saanich and Province of BC an injunction to evict Camp Namegans from Regina Park. The judge found that the Saanich bylaw permitting homeless people to sleep in parks night-by-night is an adequate response to the crisis of homelessness, at least from a municipality’s perspective. He went so far as to state how moved he was by the District of Saanich’s “compassionate” approach to homelessness. The court’s verdict accepts mass homelessness as a new normal; at past injunction hearings, judges required governments to provide shelter beds or housing in order to get court support to break up a camp. For example, to win their injunction against Super InTent City in Victoria, the Province opened hundreds of units of new housing. But in the Saanich decision, the judge did not require any new shelter beds or housing—he was content with the City’s offer of camping space night-by-night in parks, significantly lowering the bar of expectation for social responsibility for homelessness. This turn enabled a marked increase in police repression and brutality against homeless people, sending a clear message: outside of the legislated exception of 7pm to 9am in certain parks, and carrying only one tent, one sleeping bag, and one change of clothes, you are not welcome in public spaces, and any attempts you make to protest your conditions will be met with punitive force. After losing the injunction, campers relocated from Regina Park to Ravine Way, where they were hit with a trespass notice from the Ministry of Transportation and Infrastructure. The camp responded with a statement asserting that displacing them from the sanctuary of the site would violate their Section 7 Charter rights. 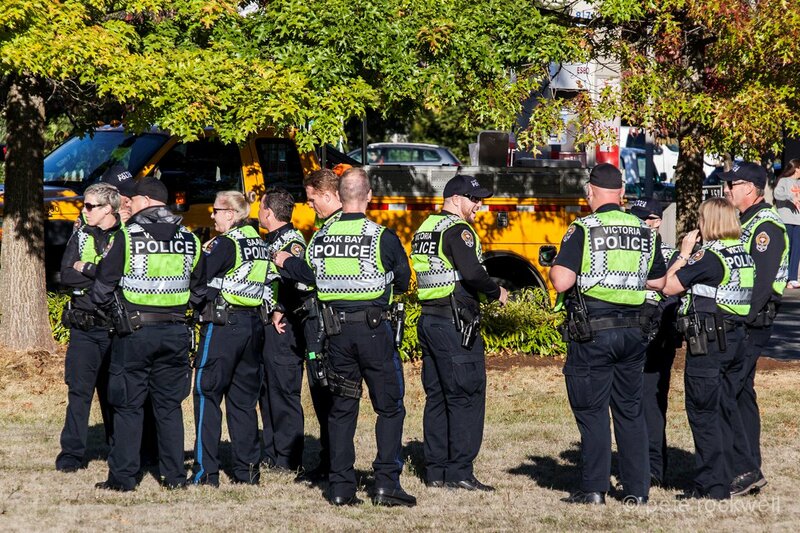 Rather than bring the matter before a judge to decide whether the ruling about the lessened responsibilities of the Municipality of Saanich would also apply to the Province of British Columbia, the Province used the raw force of the police to displace the camp. 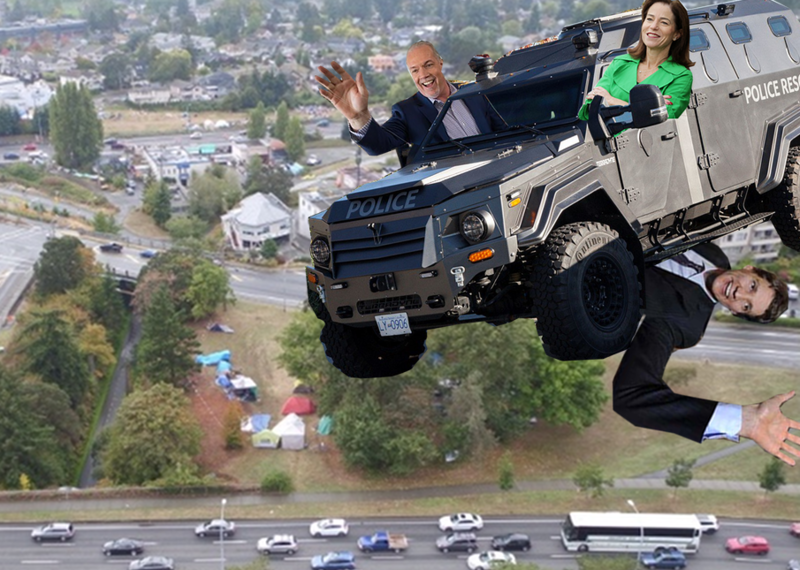 The cops have gone above and beyond the already violent measures required of them—not only did they enforce the trespass order, but they also lied to the camp’s lawyer, came with a disproportionate show of police presence, including roughly 75 officers and a militarized vehicle belonging to the Greater Victoria Emergency Response Team (a special weapons unit akin to American SWAT teams), and blocked campers from actually camping in a nearby park with a complete misinterpretation of the chattel bylaw. But pointing to the heightened fascist tactics of the police, which are clearly intended to break the politicized spirit of organized Indigenous and working class people, is only one arm of the body that attacked the Namegans homeless. The other arm is the BC NDP government. Homes? How about a sack of fascist pigs instead? In deploying the police to enforce the trespass order, the BC NDP-Green government sidestepped the unresolved question of homeless people’s Charter rights on Provincially-owned property. With just the authority of a trespass claim and the request of the Ministry of Transportation, residents of Namegans Nation found themselves attacked by the police twice in one week, with literally nowhere to go to. Rather than risk going before a judge who might find that the Province as responsible for homeless residents, the NDP decided to use police brutality to beat down organized Indigenous and working class people. On Monday, September 17th, Minister of Housing Selena Robinson stated in an interview that the camp was unsafe because of its proximity to a highway, implying with her paternalistic husk of disingenuous concern that dismantling the tent city, which serves as a sanctuary to the daily displacement and isolation of night-by-night camping bylaws, was for the good of its residents. At the same time, the NDP announced that a 25 bed shelter, normally reserved for extreme weather, will open in Saanich on October 1st, as if 25 cots in a room could address needs of the city’s growing homeless population. The NDP’s attack on Namegans Nation evokes the 1995 Gustafsen Lake standoff, which also took place under the auspices of a Provincial NDP government and saw them deploy the RCMP against Indigenous land defenders. At the time the NDP was reeling from a string of high profile corruption cases, and used an over-the-top, militarized police response to Indigenous resistance in order to gain public approval. Just as the Saanich police prefaced their raid with a tweet saying that Namegans Nation had “claimed the land as theirs”, a falsehood underlaid with anti-Indigenous colonial panic, the NDP’s response to Secwepemc land defenders who were occupying a sacred site within their traditional territory was similarly disproportionate and brutal. 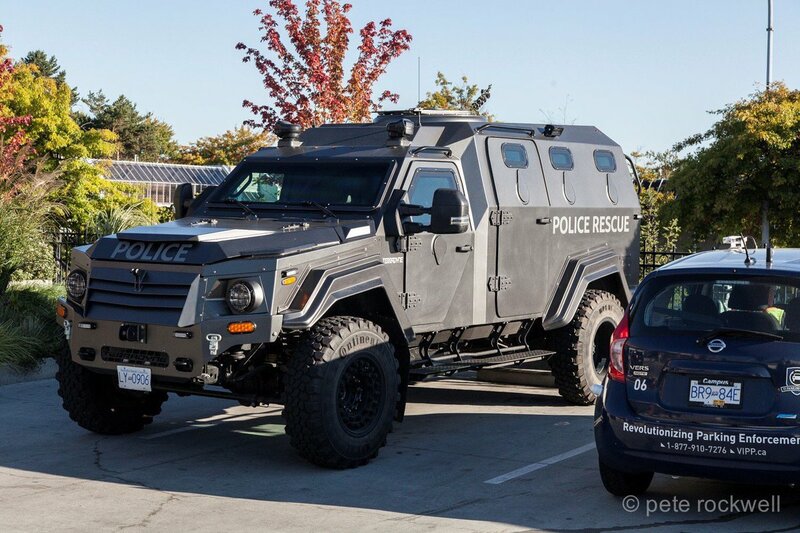 Like Saanich police, they also lied before launching a surprise attack on a no shooting zone and used smear tactics to criminalize land defenders. Despite presenting themselves as a more progressive alternative to the BC Liberals, the NDP is only nominally different, in practice proving to be even more brutal than the government before them. Their social democratic veneer and partisan brand-loyalty may earn them amnesty from unions and progressives, but their vicious attack on Indigenous and homeless people in Saanich deserves condemnation from the entire left—including the so-called “housing justice” civic parties in Vancouver and Victoria that have remained completely silent throughout these municipal and provincial assaults on homeless people. Attorney General David Eby, a former homeless advocate who traded his experience and reputation as a social justice activist for a career in politics, Housing Minister Selena Robinson, and the entire BC NDP-Green government have decided to crush homeless people’s power with raw police force. The founding of Camp Namegans tent city in Saanich and Discontent City in Nanaimo this summer demonstrated that homeless people in this Province are fed up with government neglect and prepared to organize themselves in order to both survive and politicize their struggles. In response, the NDP’s complacent failure to decisively end homelessness has ripened into outright punitive repression, designed to smash the will of Indigenous and working class people to form collective power to push for what they need. The struggle between the Namegans homeless and the Province of BC is not done. On Thursday September 20th, as police gathered to evict the Goldstream campground, the Province agreed to a concession that allows the Namegans homeless some breathing room: Namegans can stay in the campground under the same terms as anyone else and BC Housing will provide tents for some shelter from the forecasted storms. The District of Saanich also gave way somewhat and offered a parcel of land for the supportive modular housing that they previously had refused. This housing, like the additional shelter beds that the Province says will open October 1st and all housing and shelters opened by the BC NDP government, would be operated under the institutional, isolating, and humiliating policies of so-called supportive housing that was piloted by the former BC Liberal government. If not for the resistance led by the Namegans homeless and supported by hundreds of others who protested at and occupied BC Housing offices in Nanaimo and Coquitlam, and tweeted and called NDP officials, the outcome would have been different and the homeless would have received only police batons. This coordinated, determined resistance marks the way forward.